Welcome back, Mrs. Rodell! We are very happy to have Mrs. Rodell back in our classroom. It was great seeing those of you that had conferences last night! I'm very proud of the progress that all of the students have made so far this year. I'm lucky to have such great students, and such great families to work with. We made many turkey art projects this week and will be continuing with those next week as well. I will send them all home before Thanksgiving. As the weather starts to get colder, please remember to dress your child for weather. We have recess on Mondays and Wednesdays. I'm looking for toilet paper tubes for a project we're going to do next week. If you could send any in Monday, I'd greatly appreciate it! Also, as you finish your environmental print pages, you can send them in. They are due on November 30th. Once I have all the pages, I will put them together to make a book. Check out our sensory table! 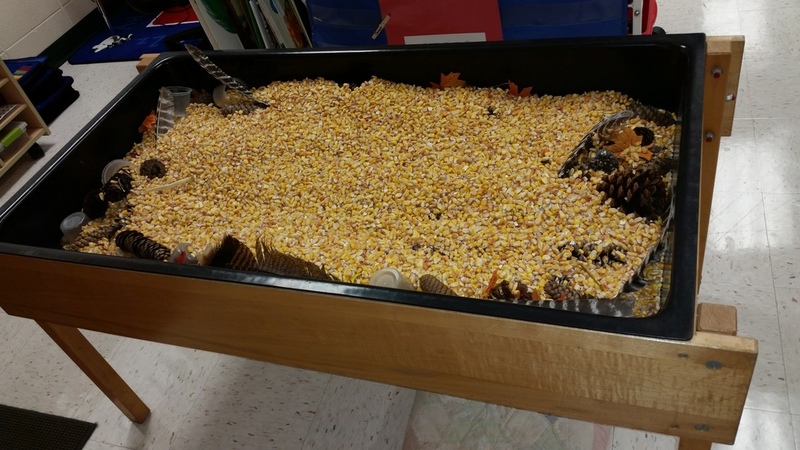 It's filled with corn, acorns, pine cones, leaves, and feathers.